The southern part of the area falls within the medieval parish of Llangwyfan and the northern part within the parish of Llandyrnog. The character area falls the lower, western slopes of the Clwydian hills, between a height of about 125-200m, forming part of the Clwydian Range AONB. 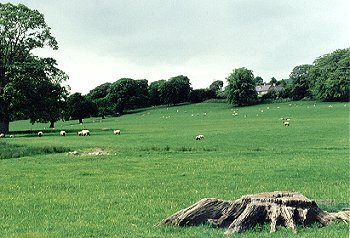 Landscape area dominated by the buildings and grounds of the former Llangwyfan Sanatorium which closed in 1981 and the large house of Vron Yw and surrounding parkland. The main buildings of the sanatorium, built 1918-20 are surrounded by many later single-storey buildings, many of which are now derelict, the whole set in wooded grounds with both deciduous and coniferous trees. Vron Yw is a large house, now a nursing home, rebuilt in 1906 but with building inscriptions of 1655 of an earlier house, approached by a long drive and set in parkland with mature oak, beech, chestnut and plane trees, with fenced land of parkland character below the house.